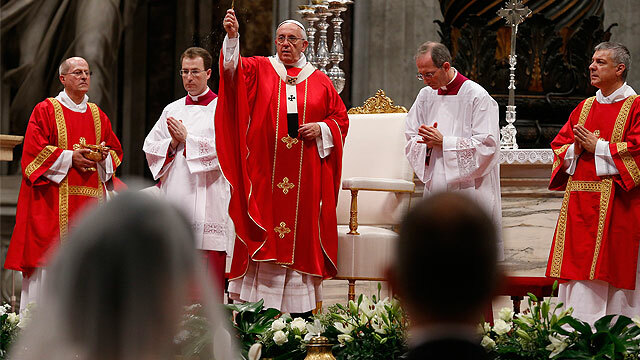 The 2015 Synod of Bishops on the Family concluded on Sunday with Mass at St. Peter's Basilica. 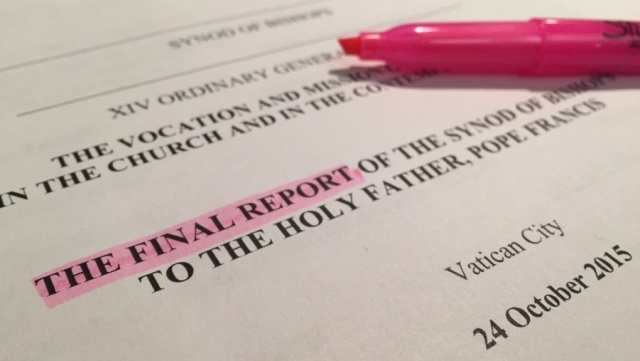 On Saturday, the relatio finale (final document) of the Synod was approved and given to Pope Francis. Archbishop Mark Coleridge of Brisbane, Australia has been keeping a blog throughout the three-week journey, and in his final post he shares his experience of the final days. 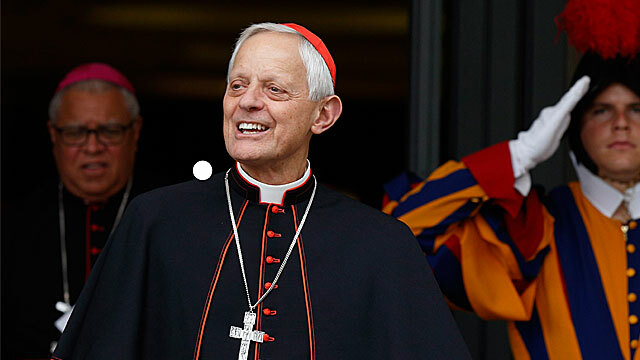 Cardinal Baldisseri began by reminding us that we had to remember the change from “ora legale” to “ora solare” – in other words, turn you clocks back. Glad he mentioned that; I would certainly have turned up an hour late for the closing Mass this morning. It was one of Cardinal Baldisseri’s finest moments. He then proceeded in the normal way to register the presences in the Hall, which is something done at the start of each session. But this was more important than usual because we were about to vote on the final document. That’s where the farce began. At the first attempt, 259 registered as present. But then two more bishops arrived belatedly, so we had to start all over again. Now we had 261. But then, in slow succession, two more entered the Hall, the last (a Curial cardinal!) to resounding applause. So we had to start all over again. Some were getting tetchy, but I found it seriously comical. After a third registration, we had 263 and we were told that now the two-thirds vote required to pass a paragraph was 177. Finally we could begin the voting. We all looked furtively at the doors to make sure no more stragglers could be seen. I should add that we have these little handsets at our seats on which you press any number from 1-9 to register your presence in the Hall. The handset also has one button saying “placet” (Latin for OK) and another saying “non placet” (Latin for not OK). We used these for voting. If you liked a paragraph (or at least thought it wasn’t offensive) you pressed “placet” and then another button saying “Confirmo”. If you felt slightly uneasy about it or hated it, you pressed “non placet” and then “Confirmo”. In all the pressing, you hoped to hell that the system worked. This evening it did, though the Archbishop of Sao Paolo had to call for a number of technicians at one point. They either fixed his handset or decided that his vote didn’t really matter. We made our way through the 94 paragraphs of the final document in something like 90 minutes, pressing our buttons and recording the results. All paragraphs received the required two-thirds majority, a couple only just. This was a minor triumph in itself. Mind you, there were only a handful of paragraphs that proved controversial, and it’s not hard to guess what they were about. You’ll see what I mean when the document is published with the votes recorded. This was something the Pope announced at the end of the session – that the final document would be published with the votes. That’s good. When the vote on the last paragraph was finalised, prolonged and spontaneous applause broke out in the Hall. The applause signalled many things – wonderment, gratitude, appreciation, relief, weariness. I found it strangely moving. The president of the day, Cardinal Assis, began to speak but Cardinal Baldisseri then gestured urgently to him for reasons that weren’t clear to me. I thought he was telling him to shut up, but no: he was telling him to stand up. This was a solemn moment of the Synod and the president should stand. I might add that Cardinal Assis is short. He read a speech of thanks in Spanish, never once looking at the audience. We all clapped when he finished, looking firmly at him. Cardinal Baldisseri then stood (of course) to address the assembly. He too thanked many people, though not himself. Finally the Pope rose to speak in that disarmingly ordinary way of his. We were all ears. He began with pro forma thanks – especially and rightly to the Secretary General. Applause and a demure acknowledgement from Cardinal Baldisseri. Then to the Special Secretary, Archbishop Forte: more applause and a more spontaneous and smiling acknowledgement of well earned plaudits. But then Pope Francis got into his stride and made another cracker of a speech to round things off. He did this at last year’s Synod, and so it was again today. I started taking notes but I soon stopped because every sentence had something of interest. I wanted to listen to this (in Italian) rather than just take notes and perhaps miss something that mattered. 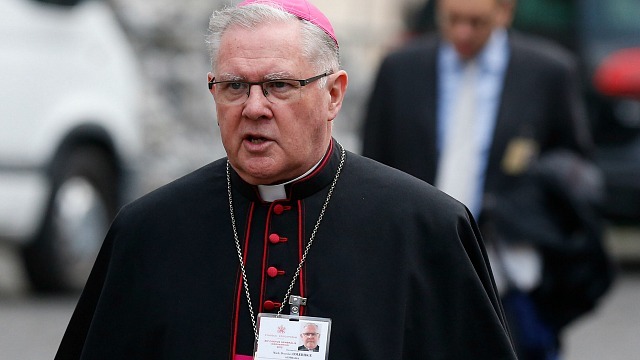 It was the speech of a man who’d heard all the voices of the Synod. He was trying to weave the tapestry and move the process of discernment a step forward. Have a read of it when you can. Like last Saturday morning’s speech, it was far from a ceremonial bon mot. When Francis finished, the entire assembly gave him a standing ovation. This was heartfelt rather than some corny showbiz stunt. We felt we’d heard the voice of Peter; it made me think of the story told in Acts 15. That was quite something at the end of this long and complex journey of the last three weeks. 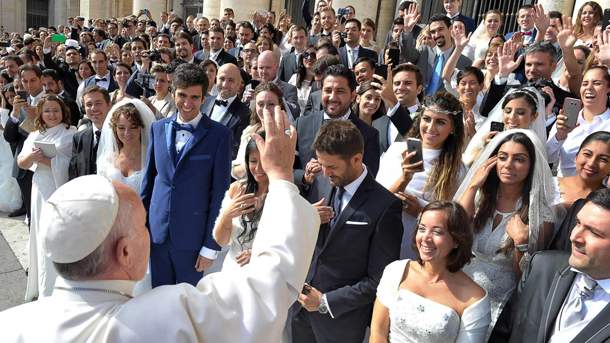 The Pope’s words left us all feeling uplifted and genuinely hopeful about all that lies ahead; because one thing the Pope made clear in his speech was that the Synod journey is far from over. He’ll have to point the way, but he’ll be helped in that by the Post-Synod Council and by the new Congregation for Laity, Family and Life that he’s established to help work out what it means to speak of the synodality of the whole Church. One of the last things asked of us was to fill out a form suggesting topics for the next Synod. This is always challenging. You have to propose something that’s relevant to the whole Church, not just one part of it – but also relevant to the world more generally. It can’t be too local or too churchy. The three that came to my mind were religion and violence (which could include sexual abuse and domestic violence), mass migration and the Church, and the relationship between local and universal in the Church (a question that surfaced frequently in this Synod and needs more work). All the suggestions will eventually go to the Post-Synod Council who will then prepare a list of three (in order of preference) to send to the Pope who has the final call on when the Synod will be and what will be its focus. I suspect he’s got thoughts of his own and may decide to look beyond the list he’s given. He can be like that. 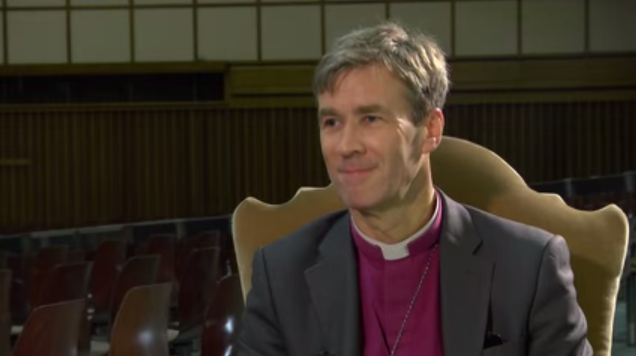 Archbishops Mark Coleridge's reflection was originally published on Brisbane Catholic.